Oxygen is the source of life and prime energy. We can do without food and water, but not without oxygen. Exar promotes oxygen excellent features and beneficial qualities, directing its properties at treatments aimed at improving face and body beauty, mind and body relaxation, thanks to cutting-edge equipment and natural products. 22 oxygen based solutions for wellness, beauty (beauty & aesthetic medicine), trichology, fitness, well-entertainment and 3 lines of natural cosmetics for homecare and oxygen treatments. Surf the website, discover all Exar and oxygen can do for you. Here more info about Exar company. Go on reading if you have tried an oxygen bar and thought: "that's a good idea but I don't like wearing the oxygen cannula! I cannot move and with the michrophone oxygen pipe things don't go better, I still need to check where the oxygen flow goes!" 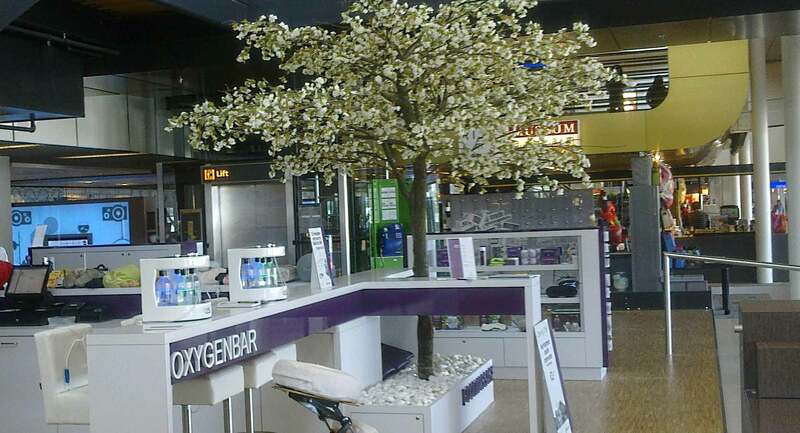 Well, with OxyFragrance forget all: you can have your oxygen bar session without wearing any kind of cannula. OxyFragrance is a system to enjoy oxygen-enriched air & natural aroma. A session is 10 minute long, already enough to enjoy oxygen and aroma. And you do all at your ease, without any cannula. In OxyFragrance you simply need to adjust the "Medusa sprayers" (its flexible stainless steel arms delivering aromatized oxygen) as you like to enjoy your fresh oxygen-aroma-enriched air close to the nose, on the skin, or just in the room. Breathe at your ease to relax and get revitalized. 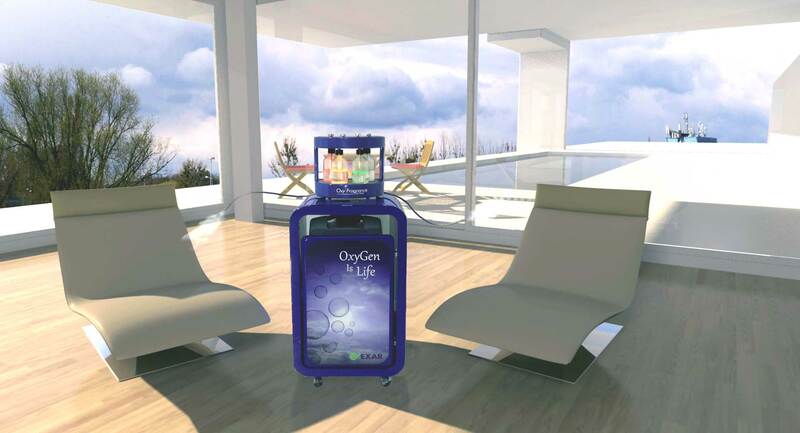 OxyFragrance can offer oxygen and aroma to 2 users per time. Enjoy the freedom of this comfortable oxygen bar! Here you will find out your three steps to take care of your beauty. Every walk starts with a step, the same happens with your beauty journey with Multi BiOxy Skin, an experience that helps you nourish your beauty. Softly. it helps to oxygenate and revitalize the tissue driving into the skin oxygen and natural cosmetics, based on fresh wheat grass and other precious ingredients. it helps to relaxe/excite the client during the treatment with colourtherapy, studied sequences of colored LED lights. In a few sessions Multi BiOxy Skin works professionally on face and body thanks to its 3 independent components: Clizia RF, Biooxyskin, Chromo. Here you find a great product for food & beverage field, a special system recognized by SIMBEN (the Italian Society of Wellness Medicine) in 2012, 2013 and 2014 (check here and here). We are presenting you a system to make oxygen enriched cocktail in just 30 seconds, using any juice or cold beverage. This is Boliss system and it is available in different versions. Each of them includes an oxygen concentrator, an Italy designed & made oxygen concentrator holder, a Boliss blender and stylish LEDs sign. Each oxygen enriched cocktail is a fresh tasteful healthy mousse to eat with a spoon: perfect to help you recharge your batteries, cope with tiredness and boost your metabolism. Thanks to the foam volume, each oxygen drink helps to feel full, so it is a good "snack" between main meals. Discover oxygen properties: your new beauty-wellness friend. Oxygen is the basis of our health main mechanism: metabolism. It is oxygen in fact that allows human body to transform carbohydrates, fats and proteins eaten by food in energy: more oxygen we breathe more energy we make. Sedentariness, smoke and pollution decrease our ability to absorb oxygen, while stress and bad dietary habits increase body oxygen need, encouraging usual syndromes of our times: mind and body physical tiredness and premature ageing.